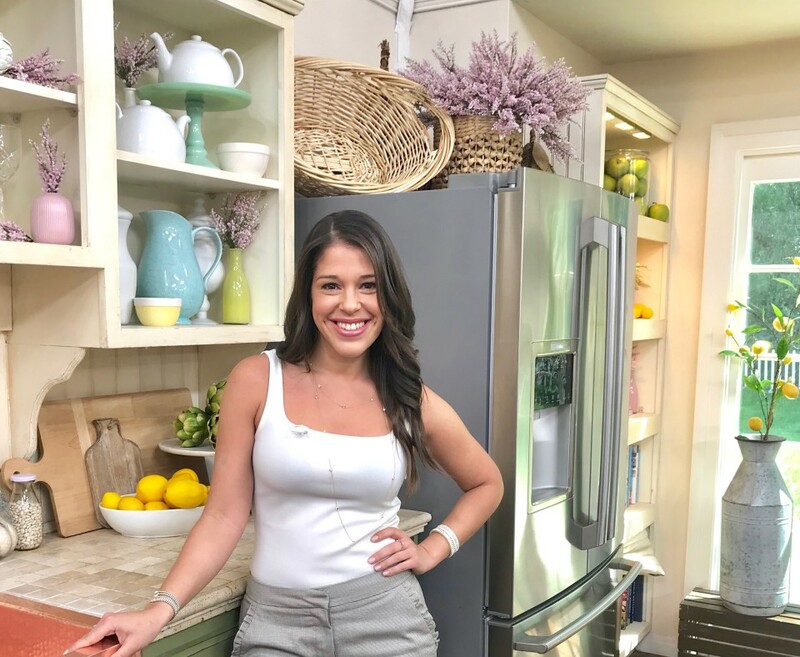 Mia Castro grew up in San Juan, Puerto Rico and was raised partly by her grandparents who gave her a deep appreciation for fresh and wholesome food. Growing up she helped her grandmother cook delicious meals every day with ingredients they harvested themselves. Today, the rising culinary star has graced local staples such as The Bazaar at SLS Hotel and The James at the Royal Palm. We caught up with Mia to ask her about her experience on Hell’s Kitchen. What made you enter Hell’s Kitchen? When I first learned about the opportunity, I thought it was something I had never done before and could only be something that would help propel me in my career. I decided I had absolutely nothing to lose so I went into it head first. I’m very glad I did. What insight do you feel you gained from the show that you didn’t previously have? Most insight I gained was about myself. I’m a lot more talented than I would give myself credit for. Having the freedom to have unlimited creativity inspired me to cook from my heart and to put more than 10 years of experience and education in the field into my food. I surprised my rivals, the judges, and most importantly myself. Due to being underestimated throughout most of my career, I think I had started to do it to myself. Being on the show and a top contender from the first episode gave me a lot of confidence in myself. Because of that, I will forever be grateful for the opportunity. I will be heading to Puerto Rico in the next week, where I’ll participating as a guest chef from April 4-7 at Saborea food & wine festival and culinary extravaganza. I’m also working on developing some content for a cookbook & cooking show. I’ll be making announcements through my IG: @chefmiacastro. When in Miami, what’s your go to dine spot? The place you can’t live without. It’s hard to stick to just one. Immediately I can think of Macchialina, by Chef Michael Pirolo. I love their simple, but perfectly executed take on fresh, handmade pasta. The mushroom tagliolini is my favorite and a MUST HAVE every single time. Also (and I have to admit I’m a bit biased), Chef Jose Mendin’s, La Placita, has become one of my spots. It captures the soul and flavor of Puerto Rican cuisine and one of the best spots to hang out in San Juan: La Plaza de Santurce. The “Cuchifritos” section of the menu is my favorite, especially since it’s hard to find this type of “street food” outside of Puerto Rico. I love the playful food they serve up for brunch at Beaker & Gray. Their “Chilaquiles” and their “Waffle Panini” are perfectly called for after a long night out of good, innocent fun! For a fun night out with friends, you would visit? I love the casual atmosphere of Wynwood. El Patio is my favorite. I LOVE dancing (to Latin music), so it’s a great place to get it out of my system. When not out on the town, what’s your stay-at-home cheat dish? Spaghetti cacio e pepe. I always have dry spaghetti, fresh black pepper, and parmigiano or pecorino cheese on hand. It’s filling, decadent, and SO easy to make. Any words of wisdom for aspiring chefs? The industry isn’t as glamorous as it seems. It requires a lot of self-sacrifice, physical & mental exertion, and time in less than desirable, low-paying positions. But if you’re NOT afraid of hard work, the payoff is extremely rewarding: discipline, travel, endless learning & creativity, mentoring from some of the best in the industry…only to name a few. My advice: in the beginning, put your head down, and watch, listen, ask questions, take notes…learn as much as you can, be a sponge. Be open to constructive criticism (learn, learn, learn) and don’t pay attention to negative comments. Define a goal and focus on it, take side-steps if you need to (don’t go back), but keep going because if you’re willing to put in the work and not give up, you will achieve whatever you set your mind to. Hot Rod Legends Tour is kicking off in Pembroke Pines this Saturday, March 16, from 8 a.m. to noon at the Walmart in Pembroke Pines at 151 S.W. 184th Avenue. The event is open to the public. You will be able to see some of the area’s coolest and wildest custom cars. The cars will be competing to become an actual Hot Wheels model. The winner from each stop on the nationwide traveling car show will win a trip to the world-renowned 2019 SEMA Show to compete side-by-side to have his or her car inducted to the Garage of Legends. Their car will then be turned into a real Hot Wheels die-cast toy car that will be sold in 2020. The event is sponsored by Dickies, the world’s leading performance workwear brand, which is bringing a celebrity guest judge: Discovery Channel’s Fast N’ Loud superstar Richard Rawlings. Rawlings and the “monkeys” from his legendary auto shop, Gas Monkey Garage, will be present and decked out in Dickies gear. Dickies will be giving away free Hot Wheels Patches, which can be applied onsite to Dickies Work Shirts. You can stop by the DJ Booth where Dickies will provide you with the specialty patch. 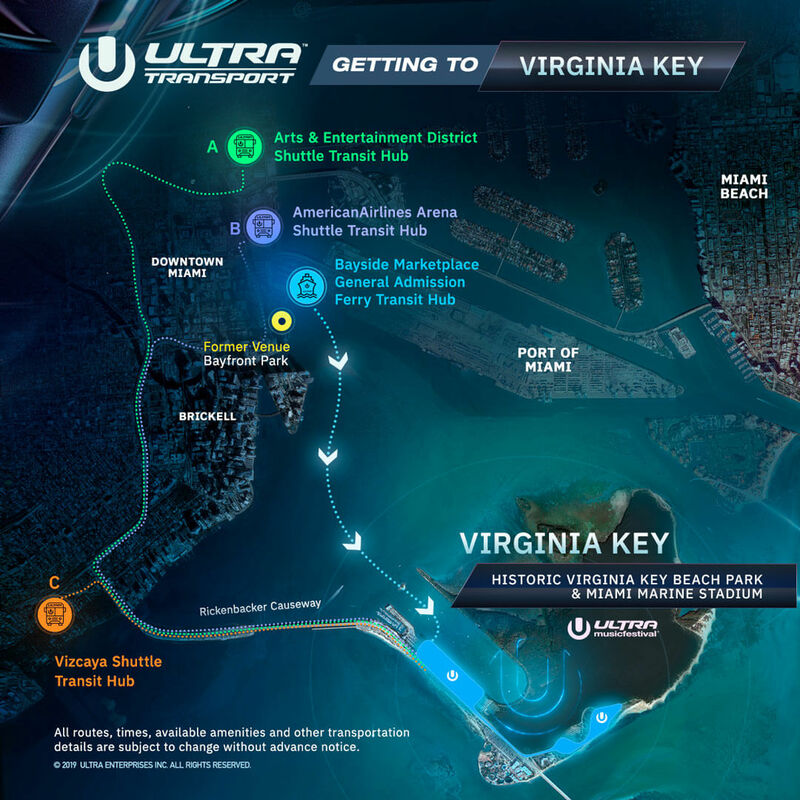 Ultra Music Festival’s new location is at the Historic Virginia Key Park and the Miami Marine Stadium. The festival announced on their website that there is no parking available on Virginia Key for festival attendees. We’ve rounded up the options to get to the festival. If you’re driving to the event, you can park your vehicle at the Park & Ride parking garages adjacent to Ultra’s Shuttle Hub A, located at the Omni Garage located at 453 NE 15th St, Miami, FL 33132 or Shuttle Hub B at the AmericanAirlines Arena Garage at 601 Biscayne Blvd. The parking cost is $30 per day or you can purchase a discounted weekend pass for $75 here. If you choose not to drive. There will be three shuttle hubs set up specifically for festival goers. Shuttle Hub A – If you’re in the Downtown Miami, Wynwood, Midtown, Miami Beach and areas North of the Greater Miami, make your way to the Arts & Entertainment District. The pickup location is at the intersection of NW 15th Street and N Bayshore Drive. Your landmark references will be the Adrienne Arsht Center Metromover and the Omni Garage. 2. Shuttle Hub B – If you’re traveling from Downtown and the Brickell areas head to the AmericanAirlines Arena at 601 Biscayne Blvd, Miami, FL 33132. 3. Shuttle Hub C – If you’re traveling from Brickell, Coconut Grove, Coral Gables, South Miami, Kendall and areas south of Greater Miami your shuttle pick up area will be at the Vizcaya Metrorail Station, 3201 SW First Avenue. The ferry will be located at the Bayside Marketplace, 401 Biscayne Blvd, Miami, FL 33132. To board the ferry, you can purchase 3-day passes as an add-on to your festival tickets here. If you use a rideshare option, Ultra has specified on their website that there is a designated drop off area. 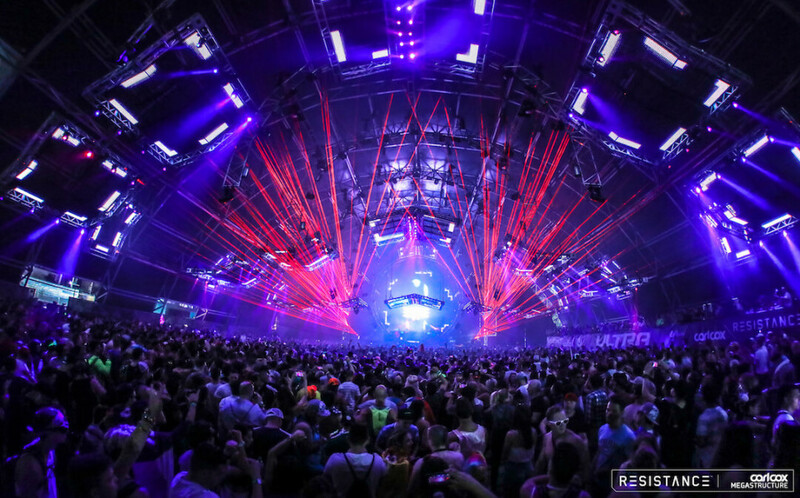 Simply type in Ultra Music Festival as your drop off location within your rideshare app. It’s recommended that once you’re ready to leave the festival, you take an official transportation option back to one of the hubs. To further plan your route to the shuttle hub areas, you can use Miami Dade’s Transit Tracker and Trip Planner here. For tickets visit the official Ultra Music Festival website here. Florida’s famous chicken restaurant Pollo Tropical® is recognizing many of its guests’ feelings that it’s better to be lucky in love than in money and is offering everyone a reason to fall in love all over again this Valentine’s Day! The brand is offering a Two-Can-Dine for $10 deal at all participating Florida restaurant locations all day on Valentine’s Day. 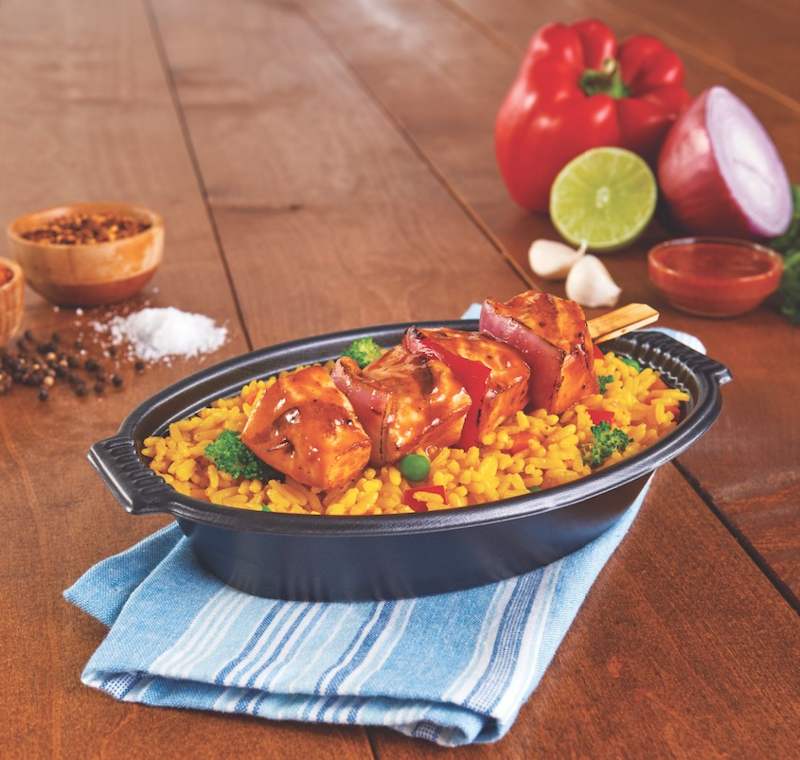 Guests can choose from the signature Pollo Tropical® 1/4 Chicken Meal or any small Create Your Own TropiChop® meal, including the new Pinchos! No coupon is required, participants just need to mention code “PT721″ to the cashier. Additionally, Pollo Tropical® Catering is also offering 10 percent off any Pollo Tropical® Catering order placed on Valentine’s Day! The discount applies to online orders via the brand’s website at PolloTropical.com/Catering, using the promo code “PT214” in the checkout section. The discount is valid only on Thursday, February 14. For Pollo Tropical® location information, to order online or for a complete menu visit PolloTropical.com. The struggle is real when it comes to finding the perfect Valentine’s Day gift for men. We’ve rounded up some last minute options to choose from. 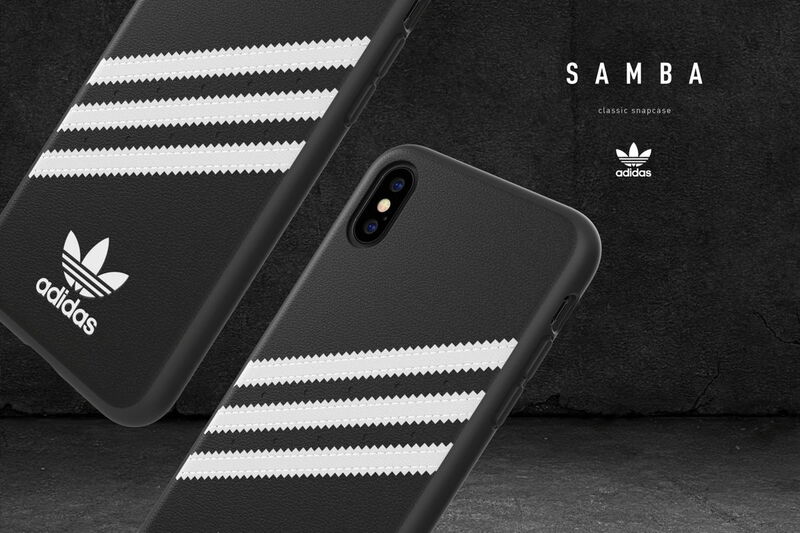 The new collections bring the iconic style that draws people to the adidas Originals brand, with sleek and lightweight designs to protect iPhones. 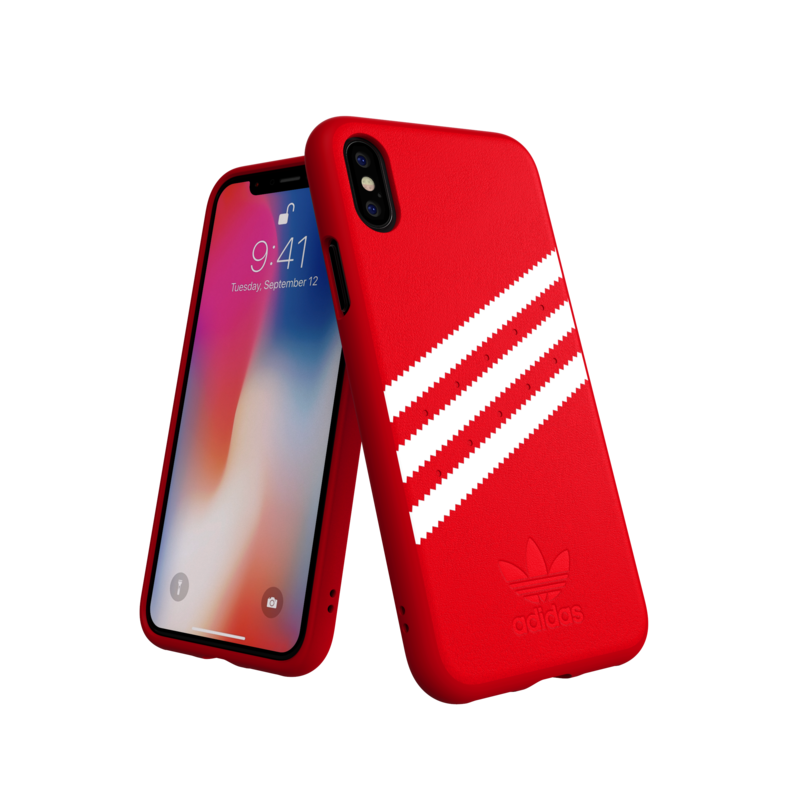 The Gazelle snap case is available in three colors: black, blue and red. The Samba Rose snap case is available in black and pink. The new adidas Originals cases are available in adidas retail stores, online at adidas.com, at AT&T (online and in-store), Verizon (online and in-store) and Amazon.com. The Invictus scent transcends from day to night occasion with a base note of Ambery Woods. 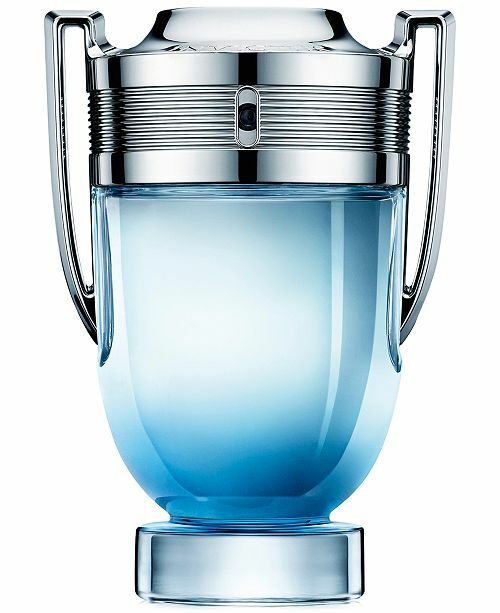 The bottle embodies a trophy silhouette with a blue gradient inspired by ocean waves. Available at Macy’s. This waterproof case for the AirPods is four feet drop proof. The material is soft silicone to protect your AirPods from scratches and scrapes. 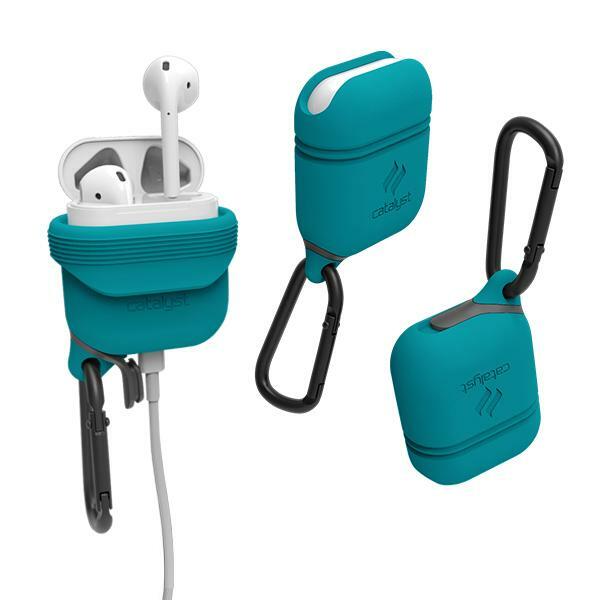 The 3.3 feet drop-proof protection case also allows for easy access to the Lightning port and comes with a detachable carabiner to help with easily hooking the AirPods onto your belt, bag or purse. Also available on Amazon with one-day shipping. 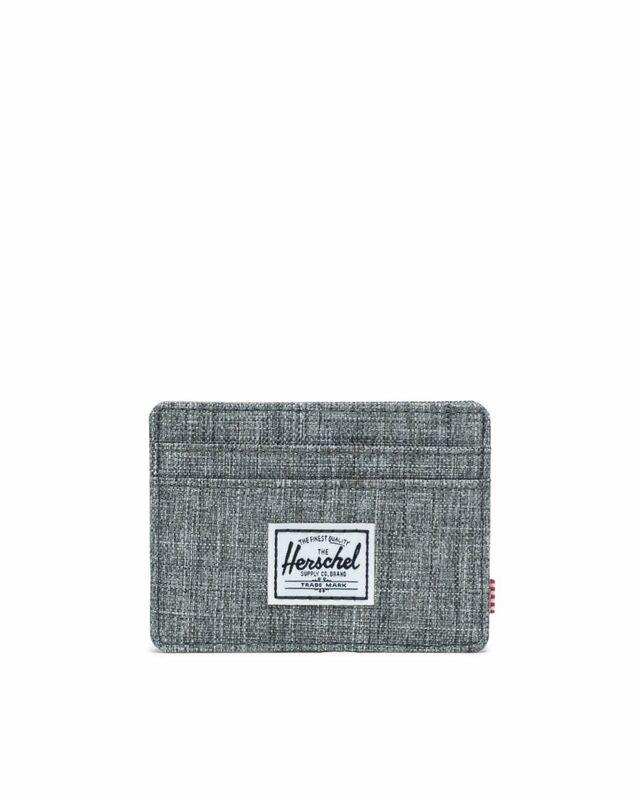 The Charlie wallet is a compact and convenient card holder with 25 color combinations to choose from. Lastly, he can match the rest of the Wade County population with a personalized jersey. Just don’t go personalizing it with “El Papi Chulo.” Keep it classy. 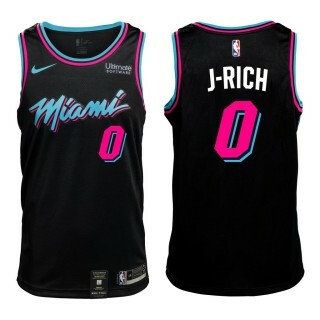 Available at themiamiheatstore.com. The most complete architecture, interior and landscaping design exhibition in North America will return this December for its second year. 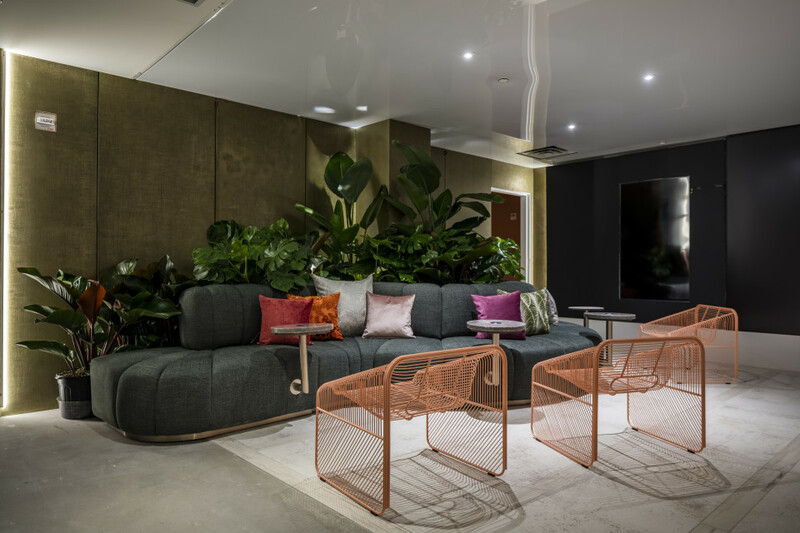 In partnership with Swire Properties and presented by COSENTINO, CASACOR Miami will take place at Brickell City Centre’s 700 Brickell Avenue building from November 30th to December 16th, 2018. Other CASACOR MIAMI main sponsors include KOHLER, FLORENSE, VONDOM, and THE LIGHTING STUDIO. An international purveyor of innovative design and world-class craftsmanship in the home design category, CASACOR Miami will continue the tradition of the CASACOR brand, annually bringing together renowned architects, interior designers and landscapers from around the world and locally to present their distinct signature styles along with the latest interior furnishings, art, color trends, textiles, lighting, home accessories and global culture. 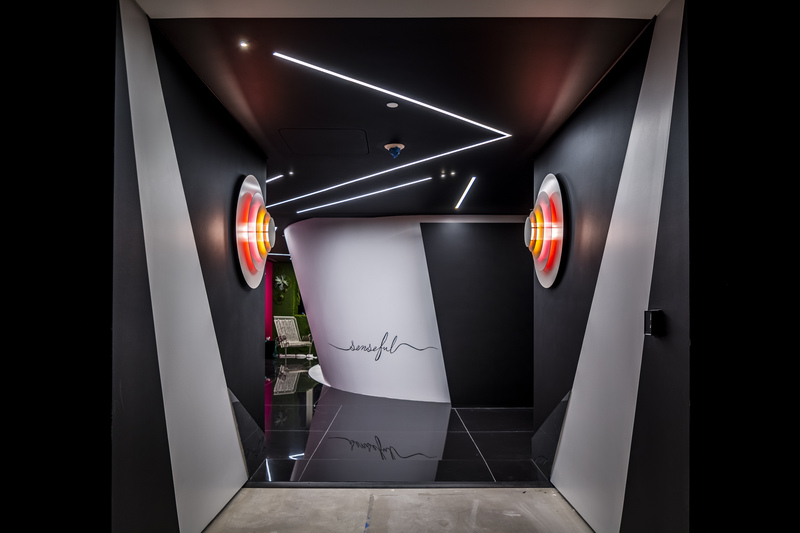 Visitors can move between different micro-environments, from wild roots to technology, to modernism, to naturalism, with design firms like D’Apostrophe, Pininfarina, and Moniomi displaying tranquil spaces. Additional established emerging designers have been hand-selected for participation including, Adriana Mavignier, Alberto Salaberri, Allan Malouf, By Lemme, Carola Bravo, Edge Collection, Guardini-Stancati Interior Design, Inês Martins, Jesus Pacheco, Léo Shehtman, Mr.O, Roye, Sabrina MacLean & Desiree Casoni Garcia, Sandra Diaz-Velasco and Tatiana Moreira. Participating artists include Carol Adrianza Ferdinand, Christian Feneck, Flora and Form, Karen StarostaGilinski, Kerry Philips, Lucinda Linderman, Juliana Aragao, and Flor Troconis, Nina Surel, Stone & Rose and Natalia Giannangeli. Also showing at CASACOR Miami this year is In Good Company, an exhibition curated by designer Fernando Mastrangelo & Hannah Martin, senior design writer for Architectural Digest. A platform for young and emerging designers to spotlight their work, In Good Company, made its debut last year in New York City and will bring the exhibition to Miami for the first time. 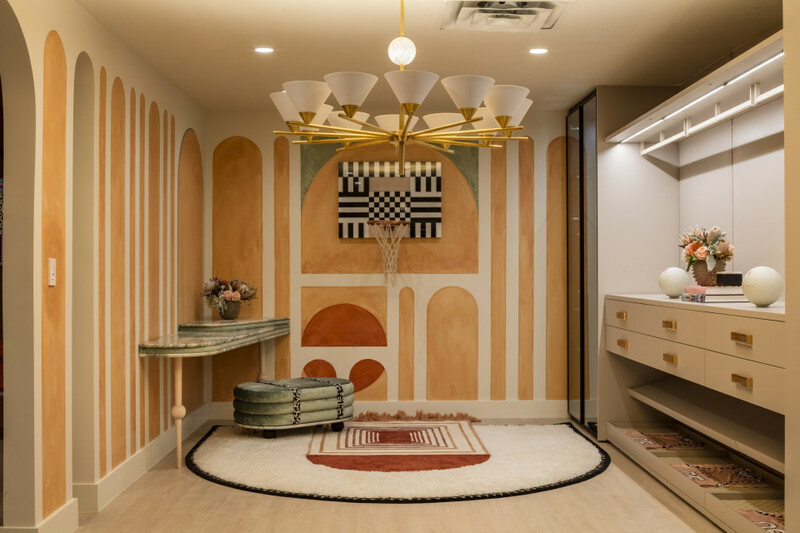 While the idea of Urban Oasis sets the overall tone for CASACOR Miami, the show is expected to appeal to a wide range of tastes. CASACOR Miami will be featured across more than 20 spaces occupying over 25,000 feet at a prime Brickell location. The 15-day experiential urban living exhibition will give guests the opportunity to meet participating design professionals and brands while engaging with innovative design ideas that may apply to their own living spaces. For more information visit http://www.casacormiami.com. 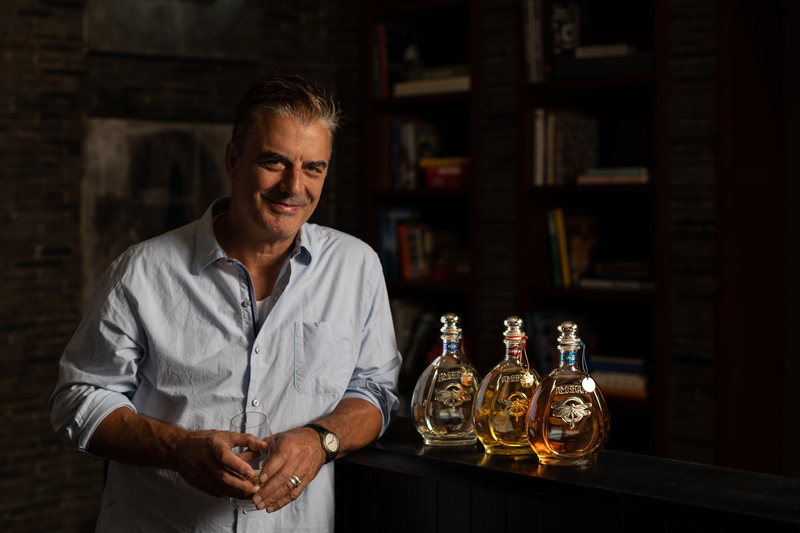 Chris Noth has acquired majority ownership of Ambhar, an artisan spirit made in small batches from 100 percent blue agave. 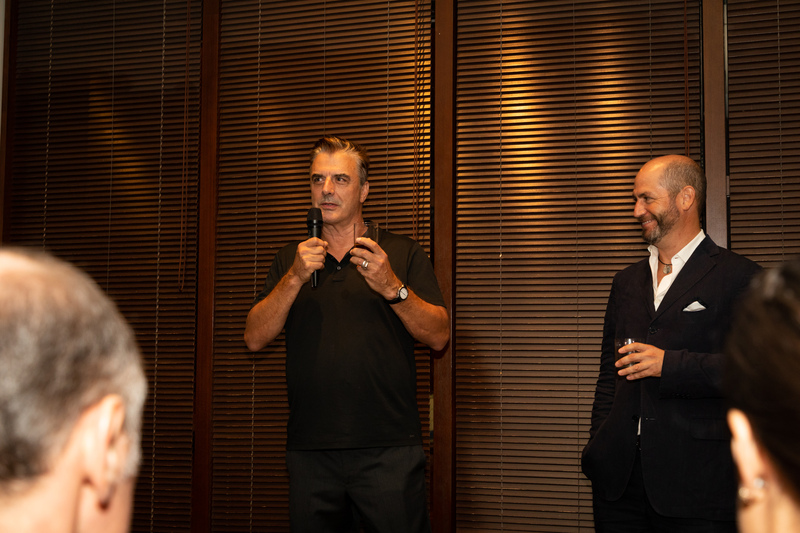 Noth took part in the launch event at The Setai Miami Beach on Wednesday, September 12. We sat down with Noth to ask him about the new venture. Here’s what he had to say. How did the collaboration get started? Is this unveiling going around the nation, in the form of a tour? You’ve been to Miami plenty of times? How do you like to drink Ambhar tequila, on the rocks? What else is in your spice garden? What’s different about this tequila? Chris then asked us. Did you like my poem? You weren’t here? You came late! He was right. We were running on Miami time. Ambhar tequila comes in Plata, a silver spirit, made from the purest form of agave with salty-sweet aromas and a refreshing, yet soft, taste, Reposado, which comes from premium oak barrels, and Añejo, also aged in premium oak barrels with notes of a smoky aroma. You can find Ambhar in select store across Florida. Norwegian Cruise Lines has a new ship called the Norwegian Bliss and there are already more than 17,500 posts on Instagram. That’s because the ship has been on tour around the United States. Which states? New York, Miami, and Los Angeles. The ship was officially christened on May 30, 2018, at its summer home in Seattle, Washington. 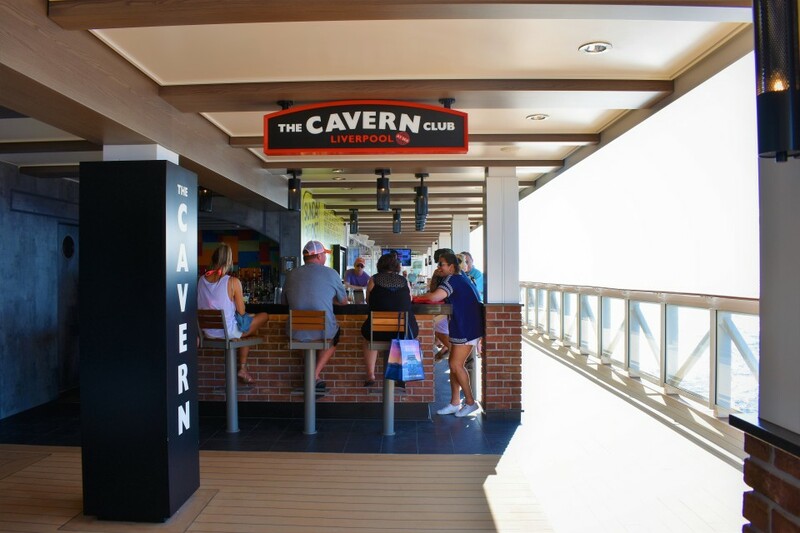 The 168,000-gross-ton ship with a capacity of 4,004 people houses programming that includes the Tony Award® -winning Broadway musical, Jersey Boys, The Cavern Club where you can sing along to your favorite songs from The Beatles live with a talented cover band, and ¡Havana! an original musical theater show created and produced specifically for the ship. The Waterfront offers a nice area to take a stroll, you can also grab a spot at the liver pool bar for a drink or gelato at Dolce Gelato. 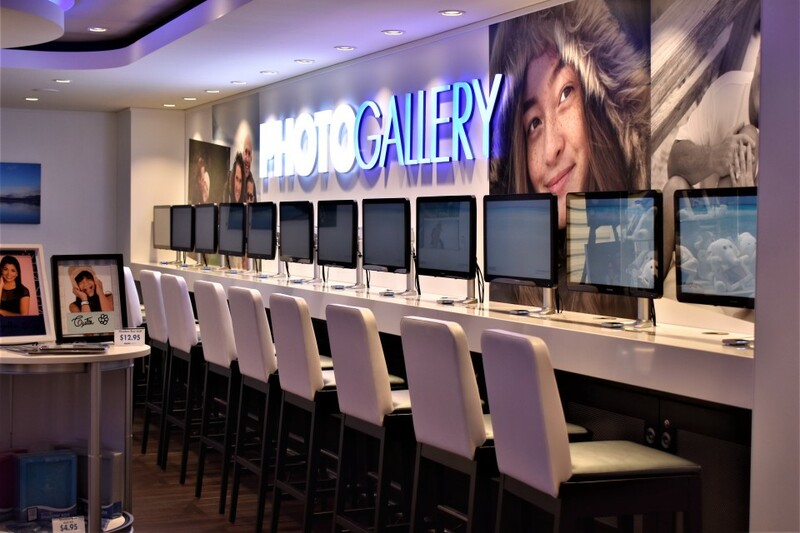 Pull up a comfortable chair at the photo gallery and choose the images you’ll like to take home. A view of the Liverpool bar on The Waterfront. The ship offers more than a dozen specialty dining options. 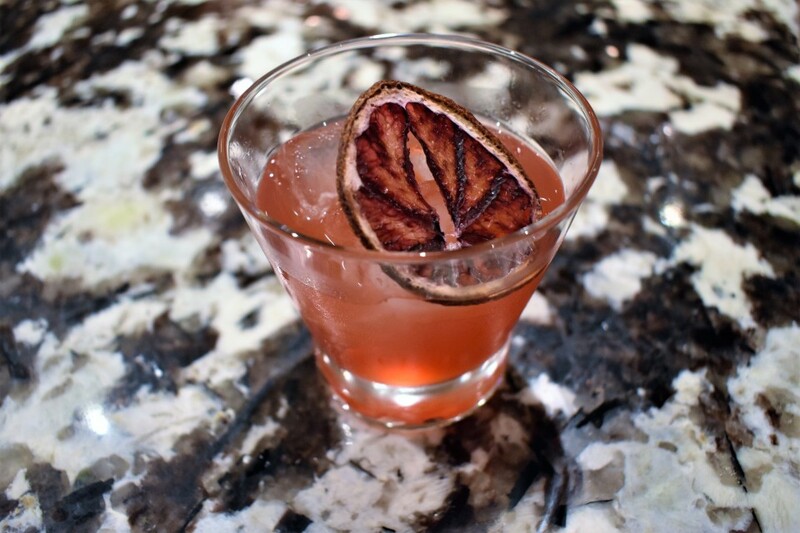 Le Bistro’s decadent atmosphere is the perfect date night spot. 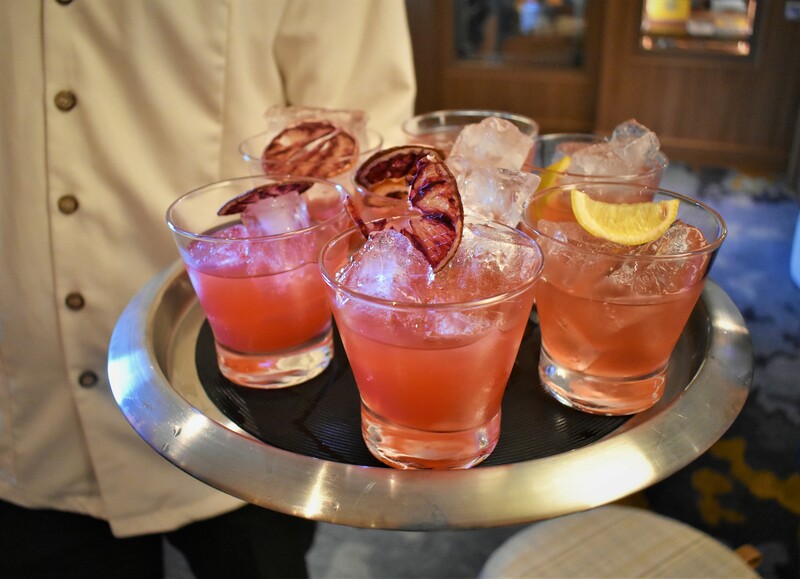 The ambiance in the French bistro is a great option for the first night on the ship. 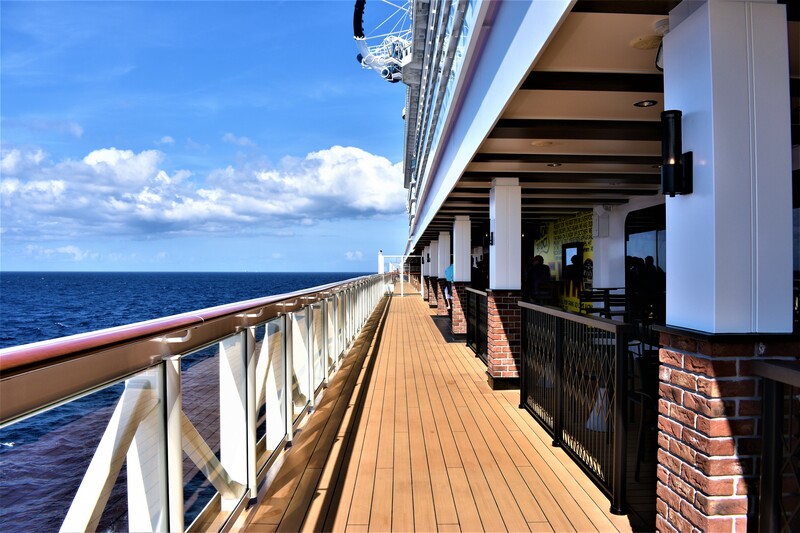 Ask to be seated near the window and catch the views, while the ship sets sail. Highlights at Le Bistro include foie gras, tuna tartare, and scallops on a bed of warm hummus. 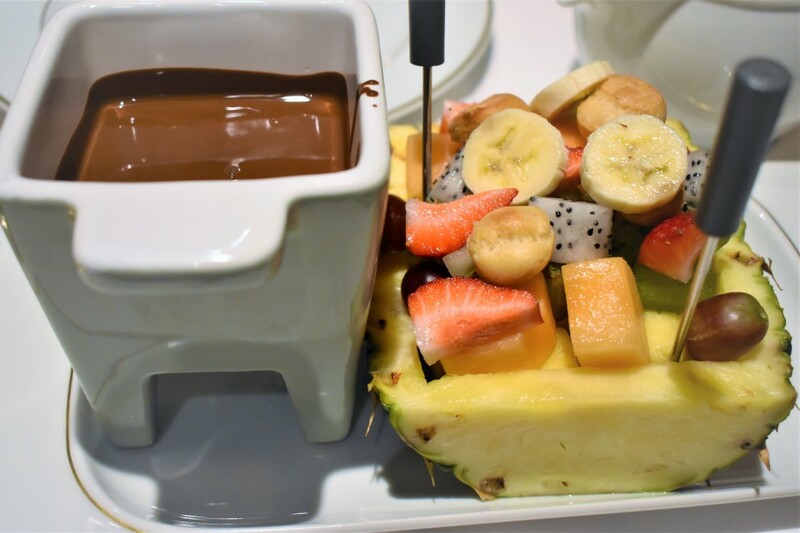 For dessert, try Le Bistro’s Chocolate Fondue for two that brings an array of fruit pieces to dunk into hot chocolate. Le Bistro is located on Deck 17. 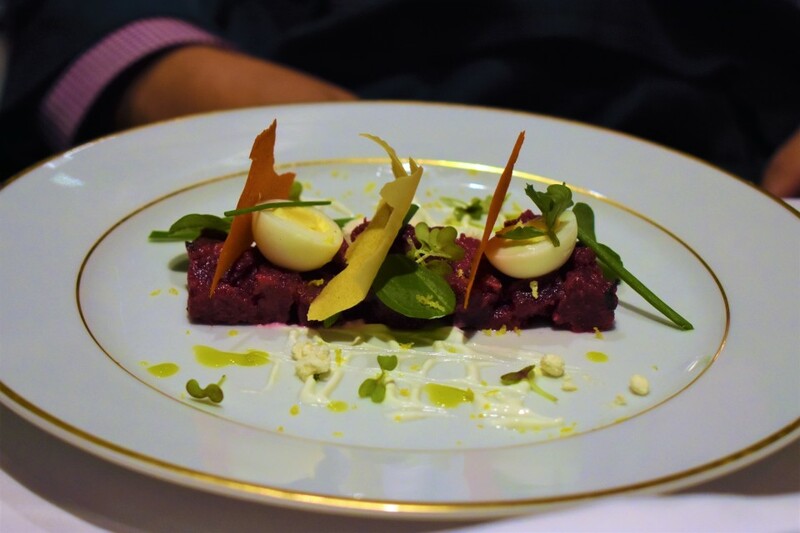 This Tuna Tartare dish is one of the many appetizers you can order at Le Bistro. At the Q, you can find ribs, chicken or brisket on the menu. The Texas cuisine restaurant also offers live contemporary pop country music each night. A hot item on the dessert menu is the fresh banana pudding served in a mason jar. For Dessert, visit Coco’s located on deck 6. 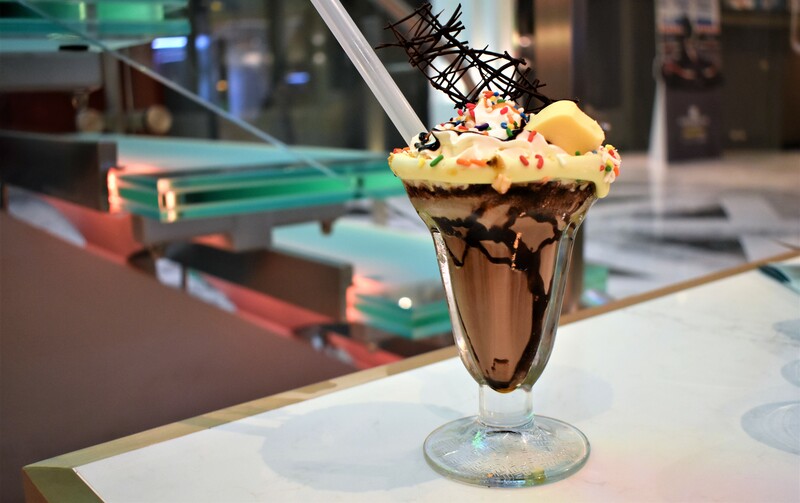 At Coco’s, you can satisfy your sweet tooth by indulging in an array of crepes, ice cream sundaes, and milkshakes dressed with whipped cream sprinkles, and hard candy. 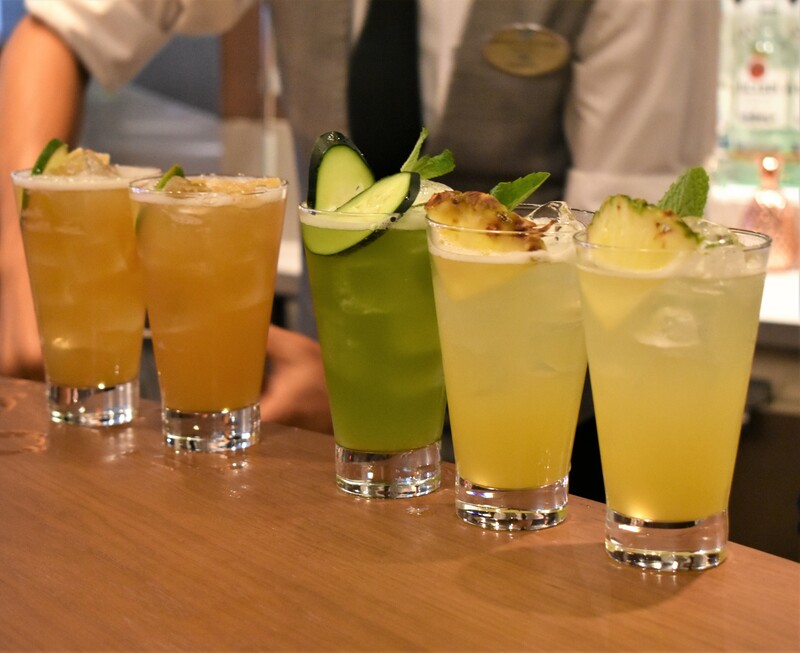 Take a sip around the world without leaving the ship. There are more than eight bars on board. You can take your A game to the A-List bar. 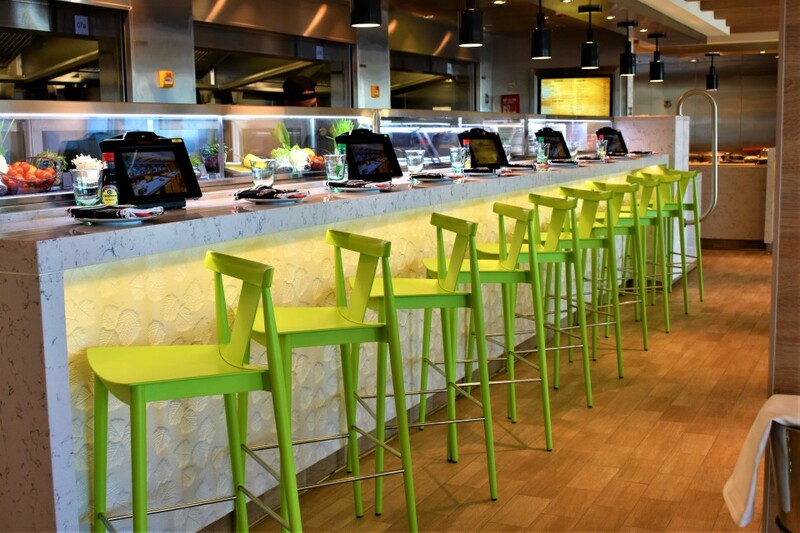 The bar is named after CEO of Norwegian Cruise Line, Andy Stuart. 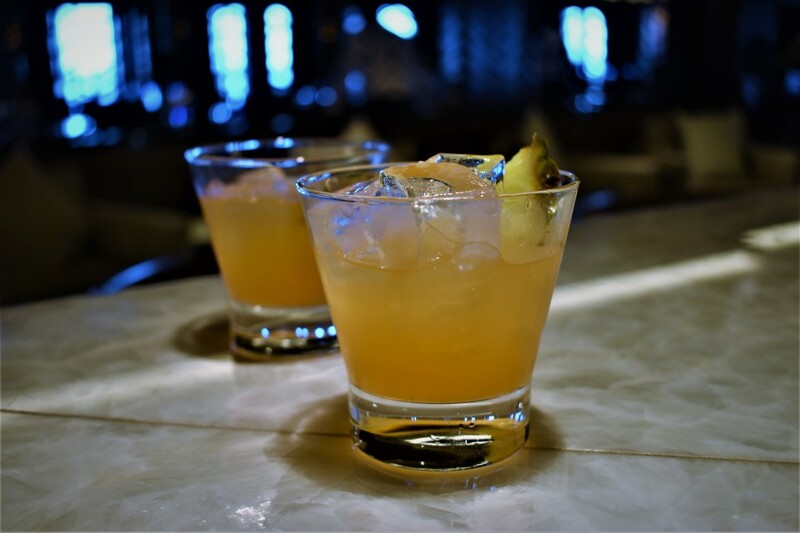 Once there order the Piña Picasso cocktail made with tequila, Aperol, St. Germain, lemon juice, and garnished with a sliced of pineapple. If you’re whiskey lover make sure to grab a seat at the Maltings Whiskey Bar. Here, you can choose from the cocktails on tap such as a Blackberry Bourbon Smash with Bulleit bourbon, cranberry, fresh lemon elixir, and blackberries or a Rye & Rum Sour with Jack Daniel’s Rye, Captain Morgan rum, blood orange puree, orange, lemon elixir, and whiskey barrel aged bitters. 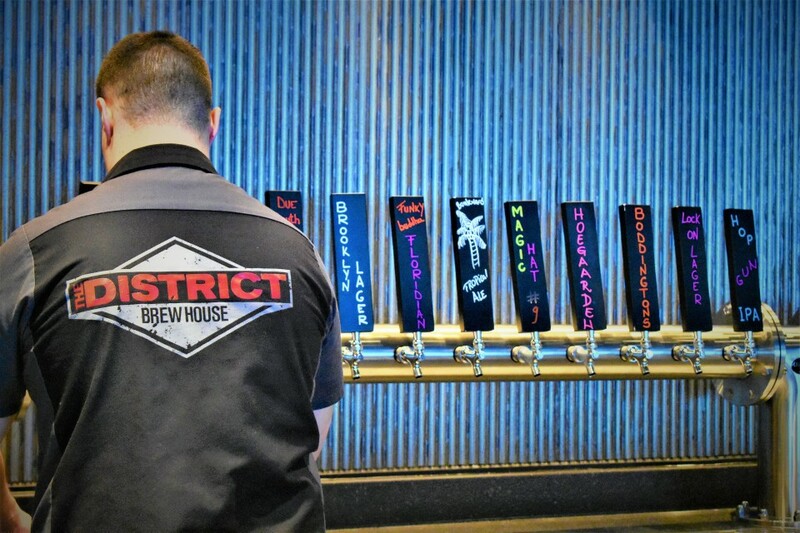 The other bars include The District Brew House that offers craft beers, Mixx bar where you can listen to a live piano performance, Sugarcane Mojito Bar with freshly muddled cocktails, the Local offers a laid-back atmosphere with bowling alley action, The Cellars Wine Bar with daily wine seminars, the Cavern Club with a view to the ocean, and more. 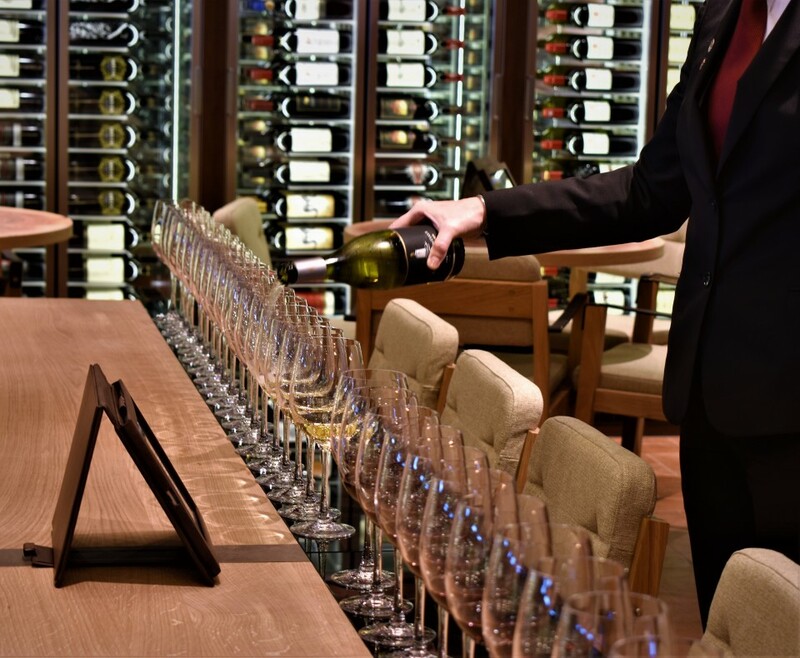 The Cellars is a Michael Mondavi Family Wine Bar. Here you are able to partake in scheduled wine tastings or order your favorite bottle to share with friends. The Cellars offers small bites from La Cucina. You can also purchase a bottle and bring it with you to the restaurants on the ship. Corkage fee may apply. 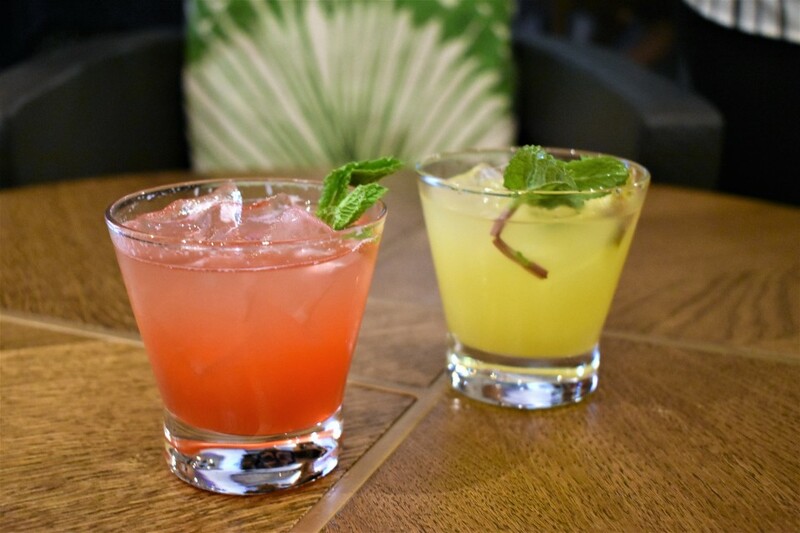 Grab hand-muddled mojitos at the Sugarcane Mojito Bar. You may recognize some South Florida craft beers on the ship at The District. The ship has plenty of options for entertainment and activities including a two-lane bowling alley, a large arcade room, and a room designed for younger ages. 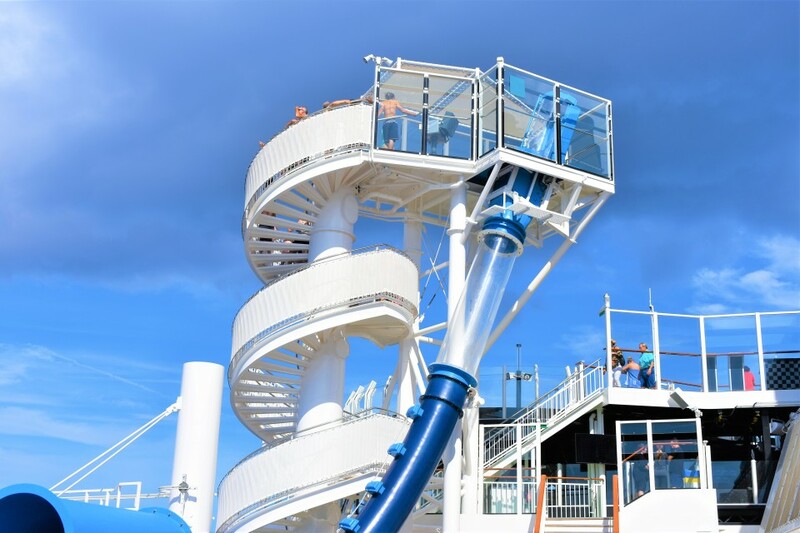 Three unique highlights on the ship are the Aqua Park, Laser Tag, and a two-level race track. Take a plunge on the Aqua Racer on deck 16. The slide launches you through loops down multiple levels. At the Aqua Park, you can race on 360 feet side-by-side inner tubes with a see-through section that showcases the striking ocean views. You can also use your racing skills to compete at the two-level electric-car racetrack. The track is the longest at sea with twists and turns at four-speed settings reaching up to 30 miles per hour. You can also test your agility at the open-air laser tag course. The laser tag space station can be visited during both day and night. The ship returns to Miami this November to sail out for seven-day trips to the Eastern Caribbean. The ship visits St. Thomas, US Virgin Islands Tortola, British Virgin Islands Nassau, and Bahamas ports. It’s August and there is no better time to add new beauty products to your daily routine. Here’s a list of beauty must-haves to look out for. Clarin’s Water Lip Stain goes on as a liquid upon application and dries matte. It comes with a brush applicator under the twist off cap to easily maneuver the stain color onto lips. The stain is equipped with organic raspberry water to soothe and soften and aloe vera extract to protect lips from moisture loss. 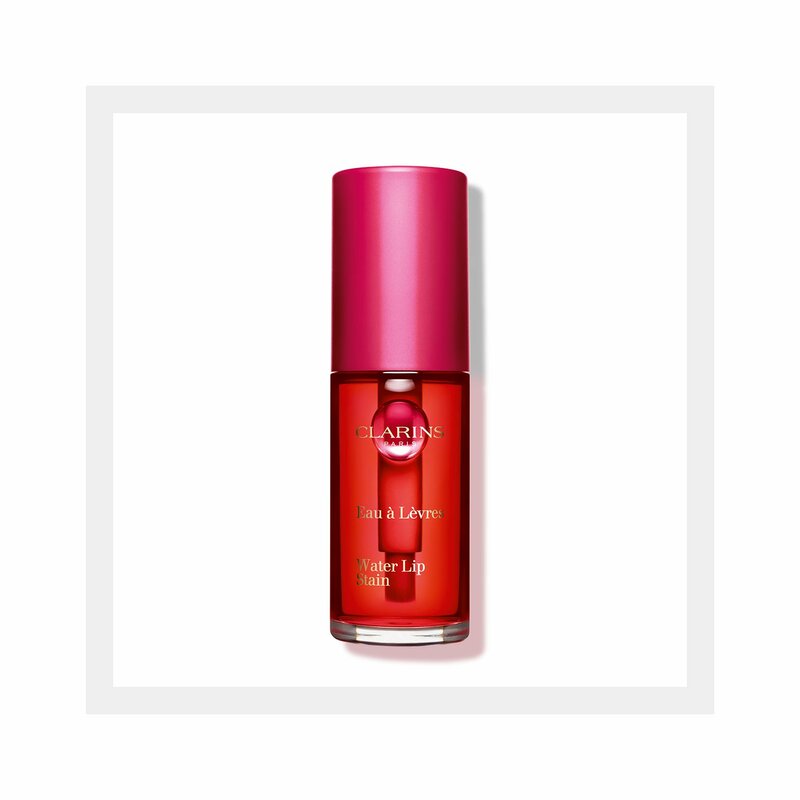 To save space in your luggage when traveling this summer, Elizabeth Arden’s Eight Hour Cream All-Over Miracle Oil is a 3-in-1 solution. The miracle oil provides 8-12 hours of moisture that you can use for your face, body and hair. Implementing a daily skincare routine is important. When you wash your face, you’re removing dirt built up, oil, and impurities. 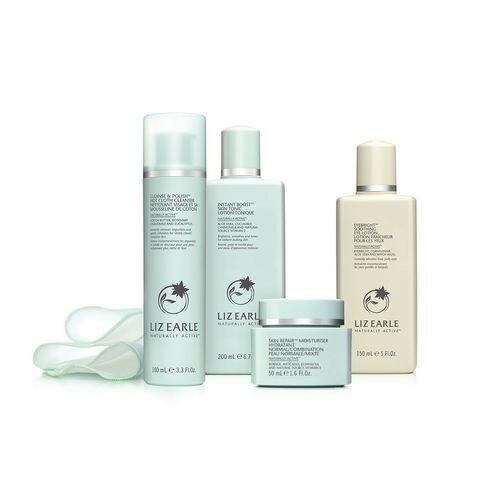 Liz Earle recently launched in the US and provides an entire skincare routine complete with a cleanser, toner, and moisturizer. The routing begins with Cleanse & Polish™ Hot Cloth Cleanser to instantly remove daily grime, pollutants and make up. Followed by the Instant Boost™ Skin Tonic to visibly brighten, smooth and tone. Then you add the Skin Repair™ Moisturizer and complete your routine with Eyebright™ Soothing Eye Lotion to wake up and refresh tired, puffy eyes. It’s like visiting a spa without leaving home. Sometimes your skin needs to fight off acne. 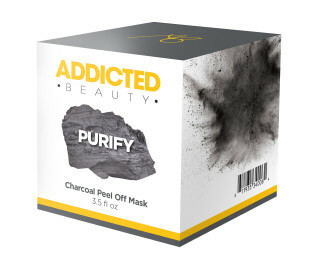 Addicted Beauty’s Charcoal Peel Off Mask helps do just that. This mask purifies the skin by binding to toxins, dirt and oil and lifting them out of the pores. The charcoal’s texture serves as a light exfoliant that helps achieve a flawless complexion while fighting off the unwanted acne. Peace out acne! It’s always fun to add a fragrance to your beauty routine. 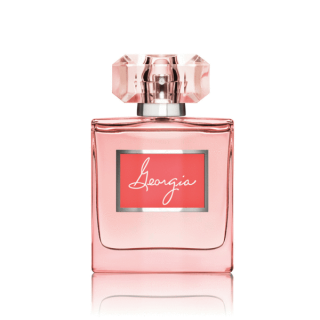 Robin McGraw’s Georgia Eau de Parfum is just that…fun and sophisticated. It features a fresh and floral scent. The fragrance is inspired by the spirit, love, power, and strength of Robin’s mother. Georgia embodies what it means to be fabulous and fierce. Skin aging and prolonged sun exposure can sometimes lead to appearance of pigmented spots on your face and neck areas. That’s why it’s highly important to find a SPF that works for you. Most experts recommend reapplying sunscreen every couple hours. But what happens if you already applied SPF under your makeup and you don’t want to mess up your look? 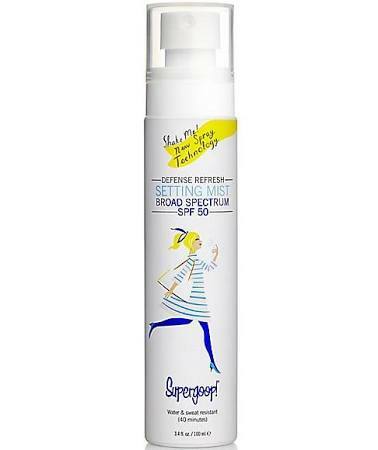 Here’s the solution: SUPERGOOP! has a product for that. 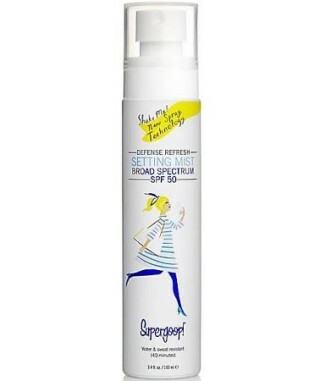 The brand’s Defense Refresh Setting Mist Broad Spectrum SPF 50 helps you reapply SPF over your makeup, while controlling natural oils, and evening skin complexion. You can find it at Sephora for $28.00. Whew! 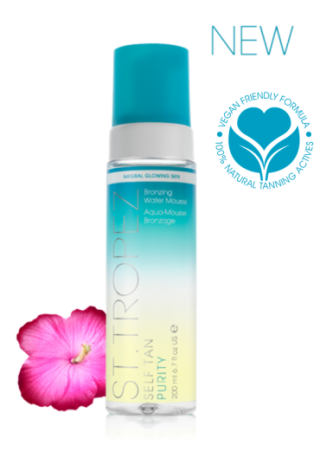 St. Tropez’s Self Tanning Purity Bronzing Water Mousse is a clear water-to-foam formula that you apply with an applicator mitt. The mousse develops into a natural looking, streak-free golden tan that lasts more than 4-8 hours. Best part is that it doesn’t transfer onto your clothing. Apply it, wait until it dries, and GO! Washing your hands helps you avoid getting sick and spreading germs, but it doesn’t have to be boring. 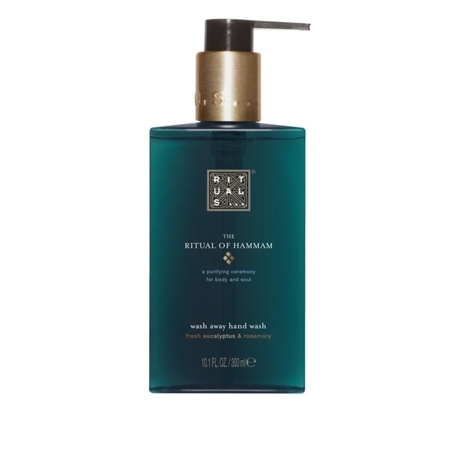 Upgrade your hand wash to the Ritual of Hammam Hand Wash. The liquid soap-free hand soap is made with hydrating, protecting, and refreshing ingredients such as Eucalyptus and Rosemary. A Rituals Shop-in-Shop is opening at Macy’s in Aventura this Friday, August 10. JOE & THE JUICE is a coffee concept with a cult following of urban trendsetters and creative thinkers. That’s why in January of this year, the brand’s team set out on a search for Miami’s Next Great Artist. 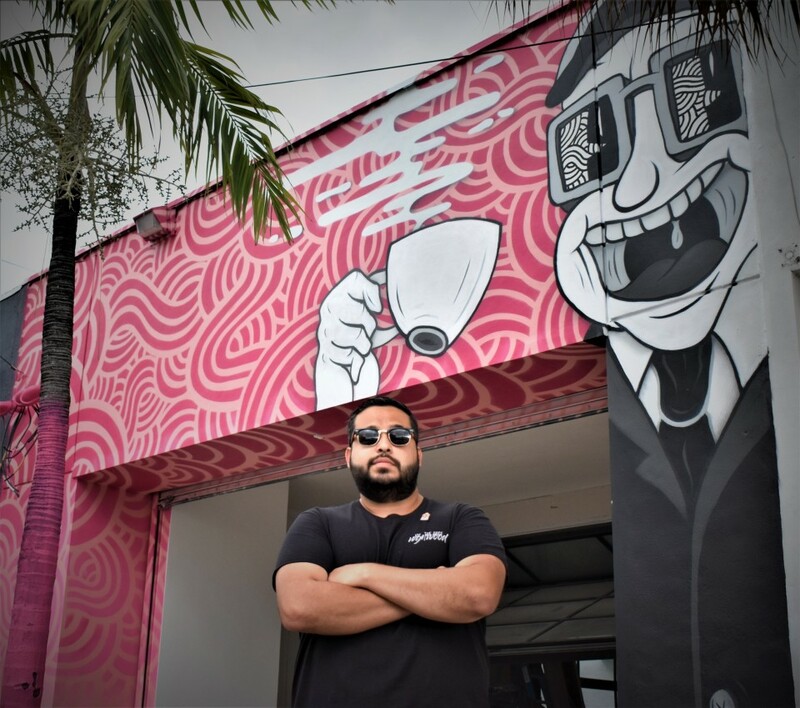 The winning artist would have the opportunity to paint an original mural on the JOE & THE JUICE Wynwood storefront and receive a $5,000 cash prize. As part of the competition, entries were submitted on Instagram via the hashtag #artforjuice. In February, JOE & THE JUICE announced the winner, Miami local artist Jorge-Miguel Rodriguez. 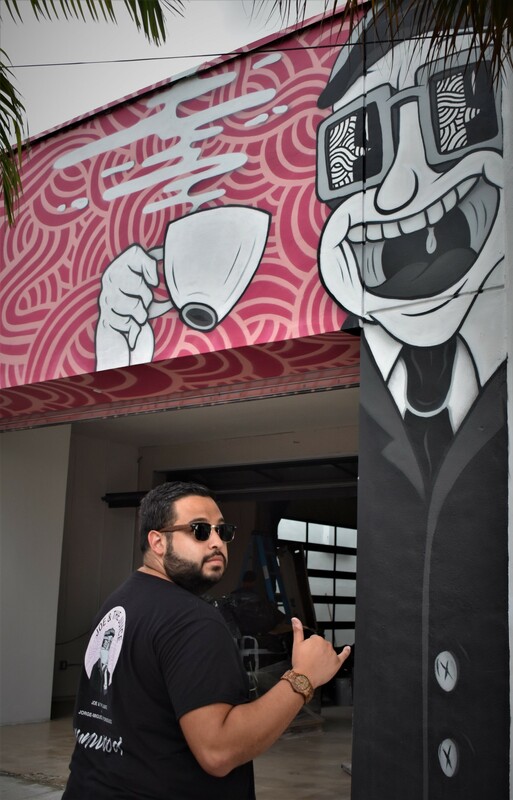 Rodriguez won the opportunity to paint the mural design at the Wynwood location and cash in on the grand prize. Rodriguez is no newcomer to the art mural scene. He has completed countless pieces in Miami, Florida. 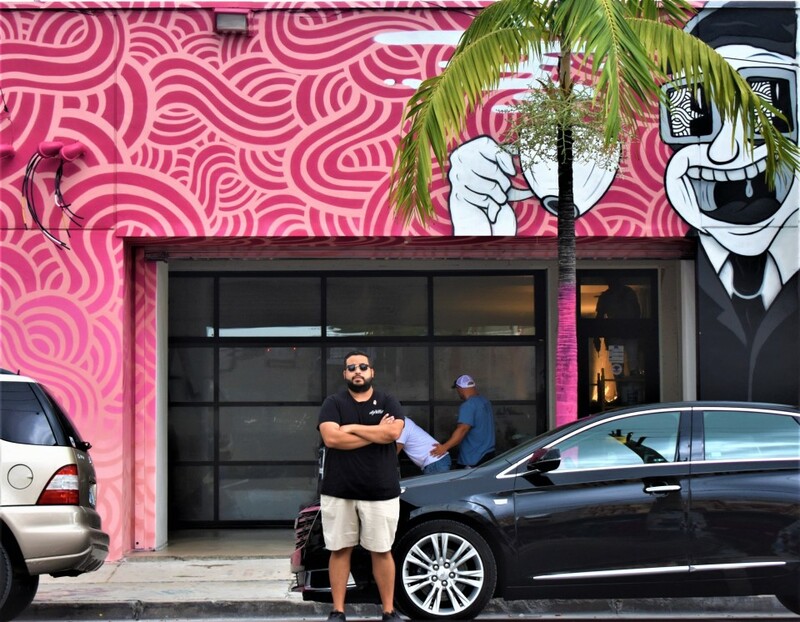 We caught up with Rodriguez in Wynwood, to ask him about his new collaboration with JOE & THE JUICE. What made you enter the #artforjuice contest? I entered the contest because I wanted to collaborate with JOE & THE JUICE. 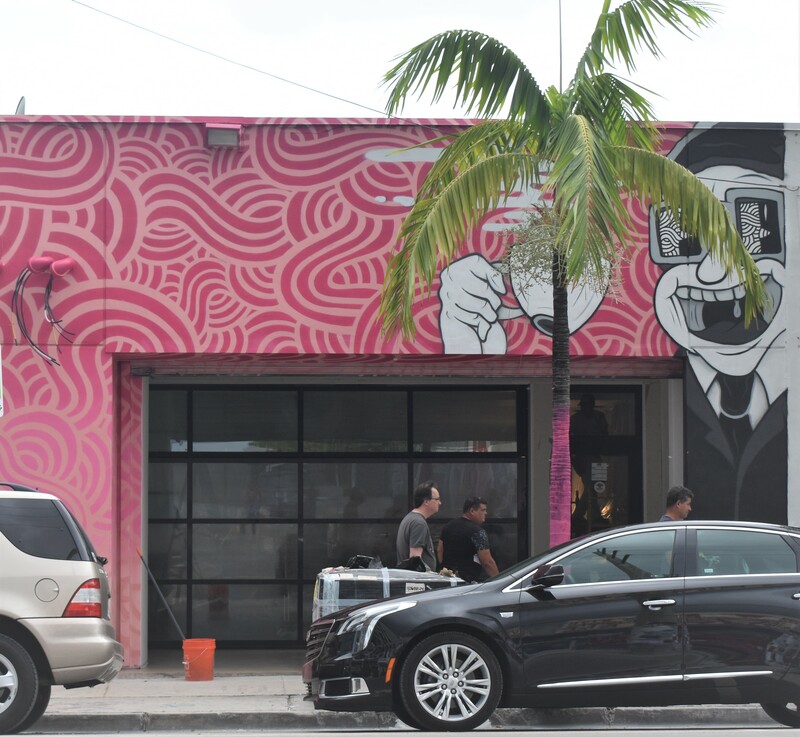 I wanted to create something really cool and exciting for Wynwood. And the new store that’s coming. Why did you feel that it was important to get in on the action? I wanted to create something different and unique. I felt that I had a couple ideas, that I thought would go perfectly with their brand and what they want to do. I took their logo and added my style to it. A little bit of My Rodri Flair. And then I created the JOE character, that’s on the wall right now. It was off one sketch and that was it. Once I created that JOE character, it was hook, line, and sinker. I created two. The second one is on the shirt. The other one is on the wall. Did you want to incorporate some Miami inspiration into the mural? 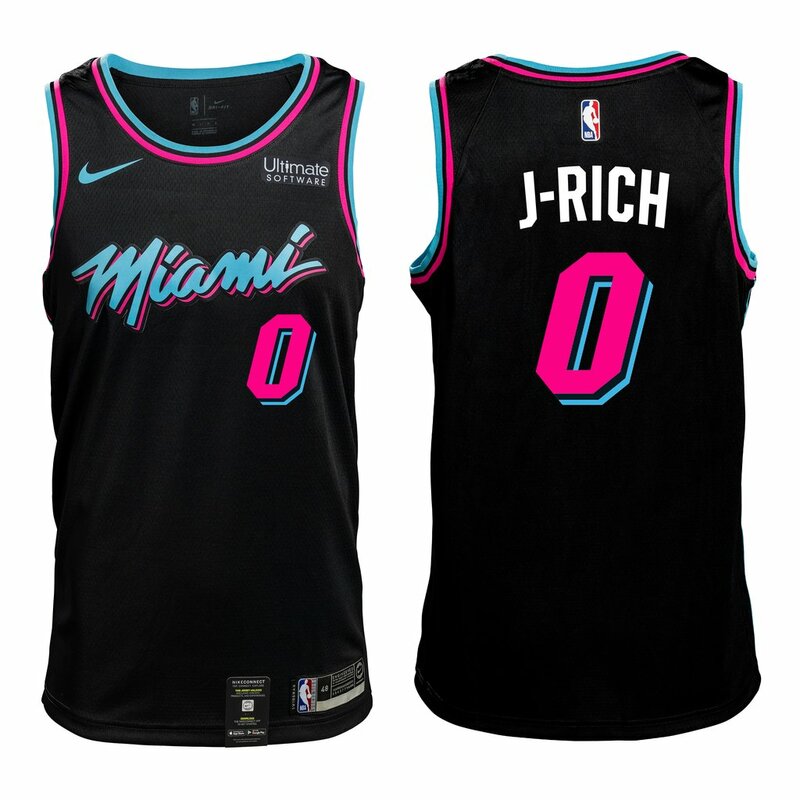 In a couple of the original designs, yes, there was a lot of the Miami colors. I’m inspired by all the colors that are in Miami. All the bright and vibrant. Whether it’s the neon or Miami Vice kind of style. From there, I took their pink and then I created a gradient to the classic Miami Vice pink, bright magenta. And then I added my line work detailed into it. What do you want people to take away from the mural you created? I wanted to create something fun and unique for JOE & THE JUICE. They represent a trendy fun atmosphere. 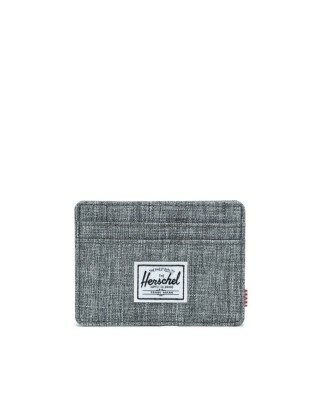 They have such a really cool brand and all the stores look really awesome. I wanted to create something that ties in together with that. All of it, just seeing the end result from the sketch to the final piece. Seeing it all come together. Through the approval process, the back and forth of the concepts and then stepping back and seeing it in full. There it is. How long did it take you to complete this mural? So the mural. I’m a fast painter. I don’t know why. As soon as I touch cans to a wall, I just go in. It took me around two days. Two and a half days. So I started Friday night, just laid out the sketch and then Saturday I put in about twelve hours. Then Sunday, cleaned up the last touches whatever little line works it was missing. Only really stopped to eat obviously, of course, because we kind of need food and because it rained. But that’s really much it, it rained in the morning and then I knocked it all out. Did you have any other challenges, aside from the rain? No. It’s typical. It’s not really a challenge. It’s usual. Like it’s raining right now. You just roll with the punches. You know? Put all your stuff away, put it inside and let it pass. I’ve been painting for about forever ago. Ever since I can remember I was doodling something. Either a wall or crayon books. Yes. Painting. I’ve always been painting. Especially, since about 2010. That’s when I got fully developed into the process and creating it into a profession. But it has always been a passion. It never stops. Anything and everything. Anyone that approaches me and says “Hey Rodri, I have a cool project.” Or “I think this will look cool here.” I’m always down for it. I never stray away from a project. Unless there are certain things that I feel are maybe a no. 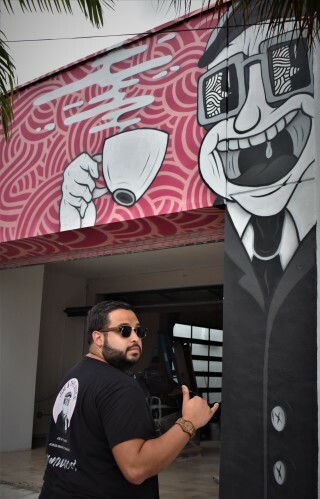 Jorge-Miguel Rodriguez poses in front of the newly completed mural. Anything you want to say to Joe & the Juice? Yes, for sure. I really want to thank JOE & THE JUICE for the amazing opportunity and for allowing me to collaborate with them. For allowing me to work with their brand and create something special and unique for this store. 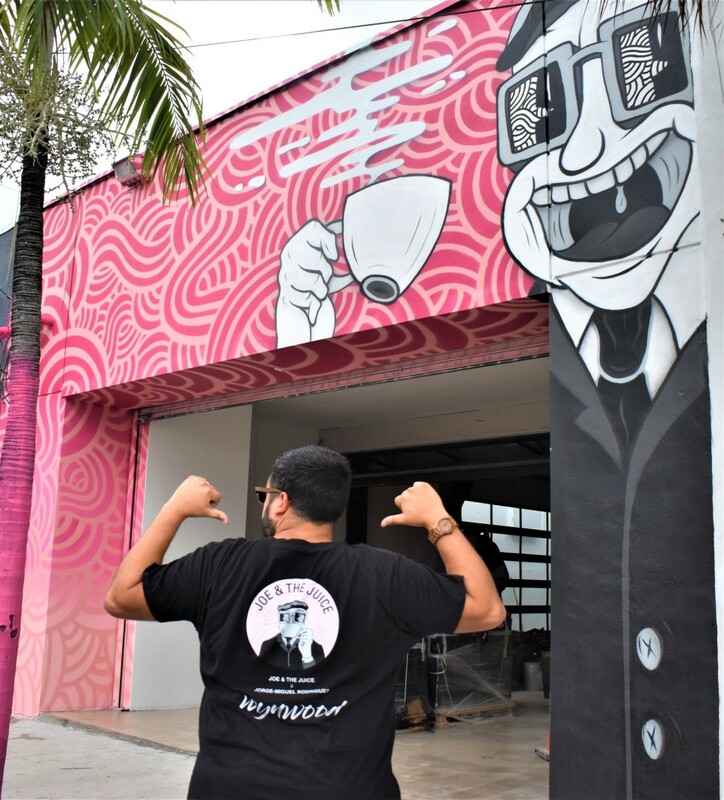 The Wynwood JOE & THE JUICE located at 3215 NW 2nd Avenue is the fourth store in Miami and marks the 242nd store opening worldwide.